So, my question is for blog readers who have or can feign expertise: Am I crazy to choose Red Laces over less worn but less familiar ones? You can probably dissuade me, but you must do so by tomorrow night. They look fine to me, go with what you know. If you're not comfortable in them it doesn't matter how well they hold up. Stick with Red Laces. If they fall apart right after, well, at least they went out in epic fashion, right? What's another 26 miles? Don't change horses in mid-stream. sticking with them sounds like it makes sense. 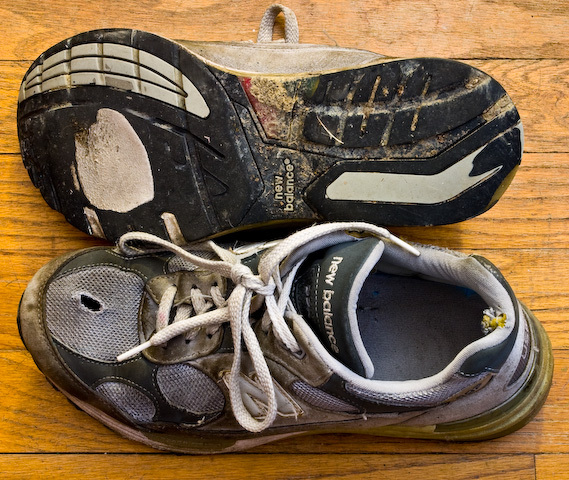 how many miles do you usually get out of running shoes? and when are they at their best, mileage-wise? I used to think that they were pretty much shot after 300 miles. I'm doing an experiment with these because I simultaneously screwed up several other old pairs by putting them through the dryer, which shrank the insoles at a different rate from the shoes and now they are uncomfortable. And from the ongoing experiment I found out that the wear in the next 200 miles is apparently much less, or at least relatively less. I don't know exactly when I would give up, though, which is related to your other question: It's pretty much a continual process whereby the padding gets ruined and so they are less protective, but the leather and padding becomes stretched and shaped to the foot, so they can be put on more tightly and therefore feel a lot better and have less chance of the foot moving around inside. I think that's continuing to get better in these even at this point. hm, that's weird that the rate of wear slows in the last 200 miles. i wonder why that would be. maybe there's some point where there can't be any more wear done to the padding. 'they just don't work anymore. they can't work any worse.' if that is the case, is it possible padding isn't all that important for your running needs? i've heard of people running barefoot. or maybe you noticed the wear down after 300 miles, thought, 'eh, this doesn't feel so great,' and then you adjusted to the lack of padding. dunno, interesting. i keep thinking in automobile metaphors--shock absorbers and treads on tires.